The $129 Apple TV 4-gen is indeed a useful output source when you attempt to wirelessly stream videos from iPad to a bigger screen, but what if you're thinking of AirPlay iPad to Mac macOS High Sierra? Back from beginning, this was a function casted away by Apple for some reasons, alienating the useful mouse & keyboard assisted iPad AirPlay to Mac from users. 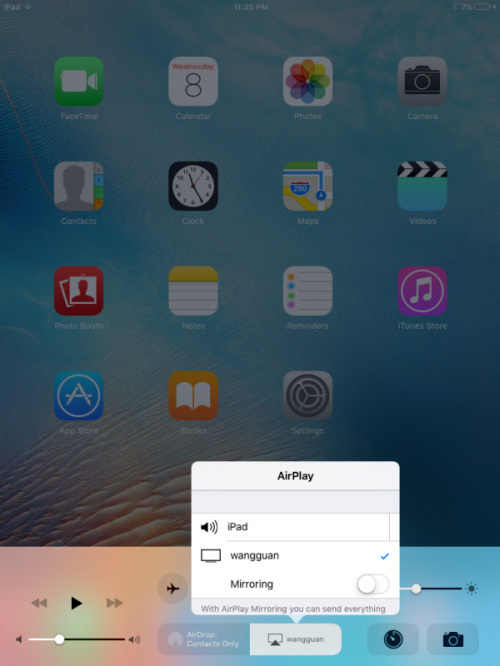 What is iPad AirPlay & How to Use iPad for AirPlay? AirPlay as Apple's universal wireless streaming protocol was first called AirTunes in 2004, and it got the current name AirPlay in 2010. 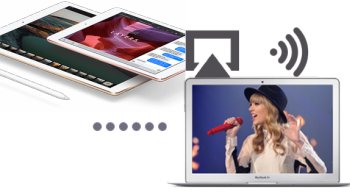 By and large, this technology is meant to help devices (Apple or non-Apple: AirPlay iPad to Apple TV) greet & understand signals from each other to achieve the replication of images, videos, music and photos from one another. However, the gap where users can't AirPlay iPad to Mac, or from iPhone to Mac, Windows wasn't filled-in until the introduction of 5KPlayer - the free AirPlay receiver that works independently from either iTunes or QuickTime. With this standalone program, any Mac computer will replace the role of Apple TV for the new iPad Pro 2. Learning about the format restrictions on iPad AirPlay and corresponding solutions first before streaming a media file. That been said, all QuickTime File Formats (QTFF) written by Apple will have no fences over the air. In other words, you'll need some help on how to change video format if your media files fall outside of this table. If you've already worked with AirPlay before, chance are that you've tried peer-to-peer AirPlay once: Unlike what we can get from AirPlay iPad Pro 2 to Mac, this iOS-to-TV, mac-to-TV only function allows you to connect 2 devices via Bluetooth and beam music, videos, and a limited number of streaming APPs: Netflix, Hulu. etc. This serves well as a temporary solution if you're suffering from a bandwidth outage for an hour or two, but stability isn't as good as standard AirPlay. Skillfully taking Apple's AirPlay technology to connect iPad to Mac, you may also see how to AirPlay iPad Pro 2 to Windows 10 staying with 5KPlayer. Wirelessly beam 720p 1080p videos, music without huddle using this AirPlay receiver Mac will usher in a brand new experience of watching videos over the Air. 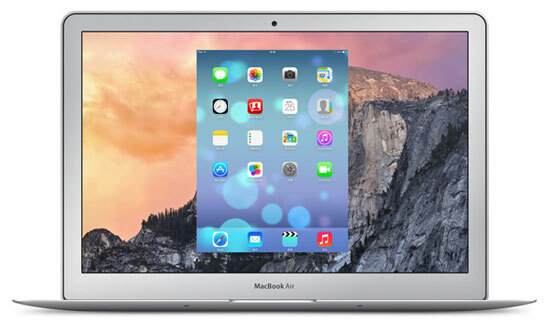 5KPlayer supports OS-level screen iPad Pro 2 screen mirroring that takes AirPlay to the next level. In the midst of playing a game, using a video streaming APP, you may one-click mirror iPad to Mac with whatever on iPad's screen. Another professional tool to help you out if you wish to AirPlay iPad Pro 2 to Mac is X-Mirage. Same pricing for Windows and Mac users at $16, this little gadget mirrors iPad screen to Mac just like 5KPlayer does. A little helpful bonus of this program is to record iPad movements while mirroring & add voiceover to it, without manually importing the record to a second video-editing software. Multi-screen mirroring out of question is the best part about X-Mirage: It connects a single Mac computer with up to 3 iPad Pro 2/Air/Mini and cast all their screen in juxtaposition, and record. Developed by APP Dynamic ehf, AirServer at $15 offers wireless streaming of the highest quality: iPad Pro 2 users who're quite familiar with Retina quality display may find iPad AirPlay to Mac output with AirServer most pleasing to eye. Going beyond the Apple ecosystem, AirServer takes wireless mirroring to other platforms like Chromebook, Android, and iPad Pro 2 AirPlay to Windows 10. 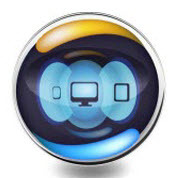 So if you're also have Android phones at home and would consider AirPlay iPad, iPhone, Android phones to Mac simultaneously, AirServer would be a useful gadget. Step 1: Download 5KPlayer for Mac, install and launch it, which helps turn your Mac computer detectable for iPad Pro 2. There's also a Windows version of this program available. 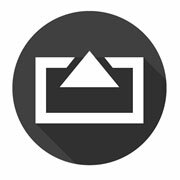 2. iPad screen Mirroring: To watch iPad APPs, games or mirror iPad home screen to Mac, toggle-switch the "Mirroring" button thereunder. Learn how to easily use the screen recoridng function of 5KPlayer to demo iPad Pro 2 APPs or other movements. Step 1: Connect iPad to Mac, enable the mirroring function during AirPlay, and when you see the whole screen of iPad replicated to Mac's display, click on the red icon to start recording. Step 2: Visist YouTube > AirRecord for the recorded video. 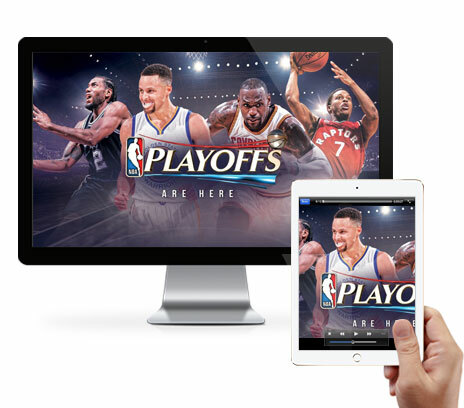 As the most integrated wireless streaming protocol, Apple's AirPlay outlines the convenient experience in connecting smaller-screen devices (iPhone, iPad, iPod, Mac) and larger displays (Apple TV) for instant screen sharing. Now with the most state-of-the-art free AirPlay receiver for Mac and Windows - 5KPlayer, you'll have no difficulty sending iPad Pro recorded 4K content to Mac, or use it as an iOS screen recorder.